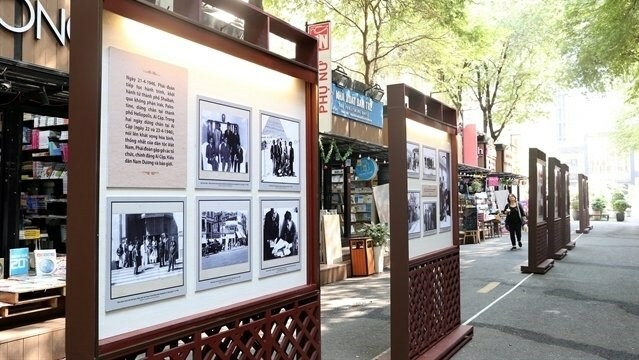 HCM City (VNA) - A photo exhibition on the first National Assembly (NA) delegation’s friendly visit to France in 1946 opened on Nguyen Van Binh Book Street in District 1, Ho Chi Minh City, on March 18. Nearly 200 valuable photos and documents on the friendly visit made by the Vietnamese parliamentarians to France from April 16 to May 23, 1946, which are kept at the National Archives Centre No. 2, are on display at the exhibition. The exhibits are arranged in chronological order of the visit, starting from the Vietnamese NA delegation’s departure for Paris to their activities during the visit. The trip was made at the invitation of the French Republic’s National Assembly. It was the first diplomatic activity overseas of the first legislature of the then Democratic Republic of Vietnam (now the Socialist Republic of Vietnam). Led by then deputy head of the NA Standing Committee Pham Van Dong, the visit was an important diplomatic activity in search of peace at a time when the country was on the brink of war.